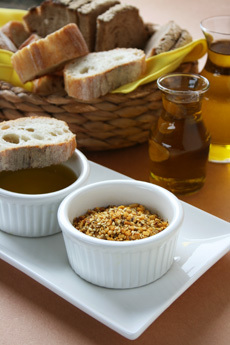 Dip bread in olive oil and then in dukkah, a mixture of nuts, seeds and seasonings. Photography by Hannah Kaminsky | THE NIBBLE. EMILY CHANG is a New York-based writer. CAPSULE REPORT: Dukkah is a versatile Egyptian dry seasoning mixture of chopped nuts or chickpeas, plus a variety of flavorful seeds, spices and herbs. In the old days, the ingredients were ground together in a pestle; today, they can be tossed into a food processor. Dukkah is an extremely popular snack in the culinary melting pot of New Zealand and Australia, where it’s a perfect pairing with the local wines. Pour a glass, cut up some bread, put some olive oil in a dish next to a dish of dukkah ground nut and seed mix, dip the bread into both, and that’s your snack along with the wine. While food trend predictors have cited dukkah as a top new food flavor for the last couple of years, it hasn’t hit home yet. Let’s hope that Americans, hungry for something new and affordable, will take it to heart and table. This is Page 1 of a six-page article. Click on the black links below to visit other pages. Thousands of years ago in ancient Egypt, somebody concocted a mixture of nuts, seeds and spices to consume with aash baladi (pita bread, also spelled eesh balady) dipped in olive oil. The bread was first dipped into olive oil and then into the nut mixture. That mixture came to be known as “dukkah” (pronounced DOO-KA, from the Arabic dokka, meaning “coarsely ground”), and it is still eaten today in this same traditional manner. However, dukkah’s greatest merit lies in its versatility: Its strong flavors and easy application can lend Middle Eastern pizzazz to meat, seafood and salads. Yet dukkah remains largely absent from the average American home cook’s repertoire. Who’s heard of dukkah? Thankfully, the folks at Oregon Dukkah are working hard to pull this ancient dish out of the days of yore and into home kitchens across the nation. While it’s not difficult to make your own dukkah (see recipe on Page 4), it’s much more convenient to have an expert do it for you, particularly one who knows how to create variations that perfectly complement American dishes. 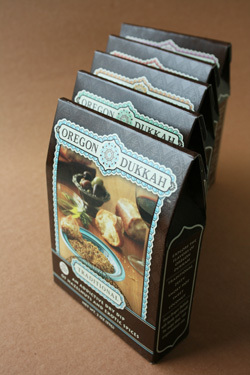 Photo: Oregon Dukkah, in five flavors, from bread dipper to coater of cheese, fish and poultry...and dessert dukkah! The story of Oregon Dukkah is a familiar artisan food tale. After receiving a gift of New Zealand dukkah from a friend (it’s so popular in New Zealand that it’s frequently found on restaurant tables with bread and olive oil, instead of butter), Donna Dockins, a private chef, decided to create a business out of it, using local Oregon ingredients. She eventually ended up with five flavors, each worthy of a special place in the kitchen. The whole line contains hazelnuts, peanuts, sesame seeds, and some variation of spices. While dukkah does not necessarily have to feature hazelnuts (although classic recipes do), these flavorful nuts coincidentally form the base of Oregon Dukkah because they are a major local crop. 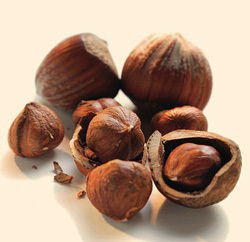 In fact, according to the Hazelnut Council, most of the hazelnuts in the United States are grown in Oregon. Although it may be true that dry dips have been around as long as barbecuing and grilling, dukkah introduces another culture to the meal altogether, imparting flavors of Egypt while retaining the familiarity of herb and spice mixes. Another great thing about dukkah is that it’s healthy. Hazelnuts are a good source of Vitamin E and have one of the highest Oxygen Radical Absorbance Capacity (ORAC) values among nuts. ORAC measures the antioxidant power in foods. Another major ingredient in dukkah, sesame seeds, are a good source of calcium, manganese, copper, iron and fiber, among other nutrients. And that’s not even mentioning all the nutrients and healthy properties of the herbs and spices found in dukkah. The olive oil that’s part of the dip is already renowned for its heart-healthy properties. Suffice it to say that dukkah is one of the healthiest items on the market today. Luckily for us, it happens to be one of the tastiest, too. You can start the conversation with the history of dukkah, and all the different uses of it (see Pages 2 and 3). Friends will be impressed to discover an easy new snack food and appetizer, seasoning and coating, least of all a nutritious one.